Amarillo legend Tony Christie knows the way to Wentworth Music Festival. The South Yorkshire superstar was born just up the road from the magnificent Wentworth Woodhouse stately home backdrop for the new one-day event, on the Rotherham and Barnsley border, also featuring Sheffield's own Heaven 17, plus T'Pau, Lemar and many more. See www.wentworthmusicfestival.co.uk. He also knows the way to keep fans happy is a greatest hits set on Bank Holiday Sunday, May 28. And yes, of course, that means the 74-year-old national treasure will be belting out his signature sing-a-long (Is This the Way To) Amarillo. "I finish the show with it. You can't follow it," said Doncaster born Tony, whose songbook also includes world wide hits Las Vegas, Avenues and Alleyways, I Did What I Did For Maria, Solitaire and Walk Like A Panther. "I've been asked many times if I'm sick of singing that song. I just wish Neil Sedaka had given me another 10 like it, as big." To honour a promise to Wentworth village, to keep traffic down on the day, tickets will not be available on the gate and come off sale a week before the event. BUY TICKETS: Tickets are £35 for adults and £10 for accompanied under-12s, subject to booking fees. Full details at www.sivtickets.com and see www.wentworthmusicfestival.co.uk. Tony added of his Wentworth festival appearance: "I'm really looking forward to it. It's going to be magic. I love playing festivals, because people are there to have a good time. "When I did Glastonbury, about eight years ago. they were singing along with you. It's great." A stella bill of 40 acts, over four stages and nine hours of family entertainment will also include 90s Good Enough Brit pop stars Dodgy, Beautiful South and the Housemartins tribute band The Southmartins and Big Shaun's Favourite Things. Host is TV and radio star Pat Sharp. Supporting local talent the festival is also putting the spotlight on hotly tipped emerging bands including The SSS, main stage openers Sundance, The Velcro Teddy Bears, The Torn and The Bar-steward Sons Of Val Doonican. Comedy stars taking part include Archie Kelly, star of Phoenix Nights, Steve Royle, who recently appeared on Peter Kay's Car Share, and Irish funnyman Martin Mor. There will be a Last Laugh Comedy Tent, a First Laugh Kids Comedy Tent, an Underground Tent, featuring unsigned bands, plus street entertainment, funfair rides, a wide variety of specialist food stalls and bars, from 11.30am to 9.30pm. Rotherham's biggest ever music and comedy event will play out in front of The Grade 1-listed building, which is twice the width of Buckingham Palace, situated in spectacular grounds in Wentworth, just five minutes from the M1 motorway. The festival strap-line is Dancing Over Diamonds, in reference to Wentworth Woodhouse's coal-mining Fitzwilliam family dynasty past, which was the subject of Catherine Bailey’s best selling book, Black Diamonds. Temptation chart-toppers Heaven 17 are lloking forward to the festival home-coming. Martyn Ware said: "It's going to be awesome and we're very honoured to be playing to a hometown crowd at the first ever Wentworth Music Festival." 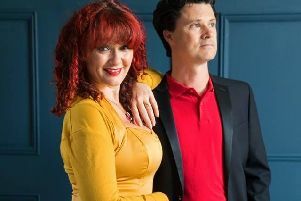 T'Pau star Carol Decker, the voice of 80s hits including number one China in Your Hand, Heart and Soul and Valentine, said of retro festivals: "It's a bit of a cliche phrase, but it's the soundtrack to your youth. We are not ready to put our feet up, sit in our slippers and watch TV for the rest of our lives. You want to party to songs that are familiar to you. It takes you back to a happy place when we were young." If There's Any Justice, The Way Love Goes and Dance (With U) singer Lemar, the BRIT and MOBO award winner, is working on a seventh studio album. He said: "I love a lot of crowd participation, so be prepared to sing and have a good time." Radio presenter pals Toby Foster and Steve White are behind the ambitious plans. Toby, who has been taking time out to co-organise the festival, will perform a reunion of sorts. The former Everly Pregnant Brothers star will team up with its frontman Shaun Doan. Toby said: "I wanted to get back on stage, without hassle, or pressure, of committing to doing lots of gigs. We just thought Big Shaun's Favourite Things, take his 10 favourite songs and knock them about on a big stage in Wentworth." Co-organiser Steve said: "We have four stages, 40 acts and nine hours of fantastic entertainment."